Overlooking the treetops to the breathtaking mountain views, this home is dog friendly, has WiFi and a spacious feel. High above the treetops, this home has the unbelievable views and so much natural light. 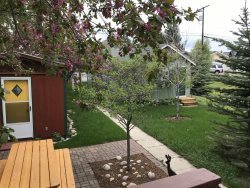 Just steps away from the golf course club house, a few minutes drive to downtown Red Lodge and only ten minutes from Red Lodge Mountain Ski area, you can't ask for a better location. This home has a beautifully landscaped yard with not one but two seasonal babbling brooks running through it. Seasonally, after you have enjoyed your BBQ dinner while sitting on the brick patio make a s'more or two in the firepit. This open floor plan gives plenty of room for all to enjoy. Nestled around the fireplace is a favorite spot to cuddle with your kids or kids with paws. Upstairs, you have a bedroom with a king, a bedroom with a twin bunk bed, a bath and the kitchen and open living area with so much light and many, many views. On the main level, you have a bedroom with a king bed, an adjoining bath and a kitchenette. Also on this level is a bedroom with two twins and an adjoining bath. There are games, books, and the living area almost feels like you are perched high in a treetop! Quick response, friendly and adequate information. Adequate space which is nicely laid out for privacy. Quiet and peaceful. Home is beautiful. Worked perfectly for our stay. The creek right next to the patio was enjoyed each evening. Very comfortable and relaxing! "Wonderful house! Very nice and clean. Had all the accessories to make a comfortable stay." "Highly Recommended - A Great Getaway Left on Dec 2, 2014 for a stay in Nov 2014 Our family recently rented the Mountain Treetop for a Thanksgiving getaway for our friends and family. The property was clean, included everything needed to cook our holiday meal & comfortably accommodated 8 people, 2 dogs and a baby. Customer service was great. Thanksgiving morning, we ran out of hot water and maintenance arrived within 15 minutes to help resolve the issue. There was a lot of wildlife on the property so you'll need to keep a close watch on pets if you bring them. I also recommend bringing some games or movies. We had some bad weather over the holiday and couldn't leave the house. The house was equipped with books and cable television but nothing to do otherwise. I think our kids liked this place better than our actual home; we're planning another trip in February to do a little skiing." "Perfect house for the Bridal Party My sister got married in the Red Rock Creek Resort and this house was the perfect location for the bridal party. The house location was close to down town area to get last minutes items for the wedding. There were enough beds for everyone to sleep on. A great living room with plenty of couches and chairs. Loved the kitchen, it was almost stocked with everything in it. Wonderful service from the rental office. The first night we all arrived we had a BBQ and sat outside next to the creek in the evening. We all chipped in on the price of the house, and it was much cheaper then staying at a hotel, plus we cooked our own food. It is definitely the perfect house for the bridal party."